Milani Everyday Eyes Powder Eyeshadow Collection comes in five different color combination palettes. Not only that but the satiny texture of the shadows is on par with high end makeup brands. They have great color payoff and blend smoothly, wearing for hours on end. Each palette includes a mix of matte, satin, and shimmery shades. There is the Smoky Essentials palette with neutrals and blues and even a black. There is Plum Basics with neutrals, pink, plum, and a deep purple. There is (my favorite) Earthy Elements with neutrals, bronzes, and a gorgeous terracotta. There is Bare Necessities with golds and coffee and browns. And there is Must Have Naturals with very neutral neutrals and a velvety black. All the colors in all the palettes are absolutely luscious and easy to use! 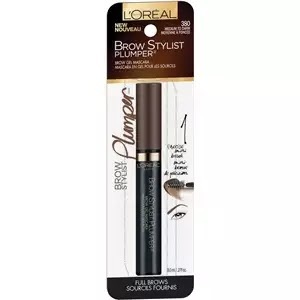 L'Oreal Brow Stylist Plumper Brow Gel Mascara holds your brow hairs in place like nobody's business. More than any high-end brand I have tried in fact. It does this without being crispy or crunchy, although it is a bit stiff. It also has significant color/pigment which makes it the lazy girl's best friend - just swipe it on on your way out the door and your brows will look groomed. It is supposed to have fibers in it to fill out thin brows and the only other brow gel with better fibers is the Benefit Gimme Brow ($24). But for $7.99 I feel that you are getting your fibers worth. There is a corresponding brow pencil, the Brow Stylist Definer which is also terrific. You can read more about it in my empties, summer 2016 post. Maybelline ColorSensational Bolds Lipstick is a new formulation that is so awesome they are always sold out at my local Walgreens. The colors truly are vivid and bold and unlike most drugstore lipsticks they include some funky shades such as navy and black. I bought the Dynamite Red which is a true red like MAC's Ruby Woo ($17) but a few shades deeper. It is stunning! The formula of these lipsticks is a soft comfortable matte - not too dry or dull at all. And boy do they last! I drank a big mug of tea without it making hardly any difference in how it looked. I've got to go back and buy a few more shades! Almay Age Essentials Concealer is actually a great concealer for people of any age. That said, it has dimethicone for smoothing, hyaluronic acid for plumping wrinkles, and sunscreen for preventing aging. I love it because it is super simple to apply and blends in like a dream. The coverage is medium, not quite enough for really dark circles, but I love it for its swipe-and-go ease. It is a stick concealer but unlike many of it's kind, this is not cakey in the least. It has become a staple in my makeup collection. Maybelline FaceStudio Master Contour Compact is loads of fun. It includes a bronzer/contour shade, a blush, and a highlighter. I am in love with the bronzer, the blush is flattering, and the highlighter is pretty good (nothing too wild). It is a goof-proof contour kit perfect for those who are just getting started with contouring, or those who want a no-brainer makeup application. It comes in two different palettes: one for light to medium, and one for medium to deep. I've got some fairly pricey contour kits and I love this one just as much. There are so many wonderful drugstore makeup finds out there - what would you recommend?